Classic cocktails get a modern update with an infusion of fresh, seasonal, and modern ingredients. With an inspired mix of contemporary and traditional cocktails, and whether to serve them shaken or stirred, on the rocks or straight up, Cocktails offers a flavorful range of spirited beverage options. Cocktails features 54 diverse recipes of contemporary cocktail classics with tips on how to stock a bar, garnishes, ice, glassware, hosting a cocktail party. Chapters include: Gin, Whiskey & Bourbon, Tequila, Vodka, Rum, Frozen, Basic Cocktails and Bar Snacks. Beautifully photographed, this book also covers all the cocktail-making basics, from how to stock a bar, infusions, and garnishes, to serving guidelines, glassware, and hosting a cocktail party. 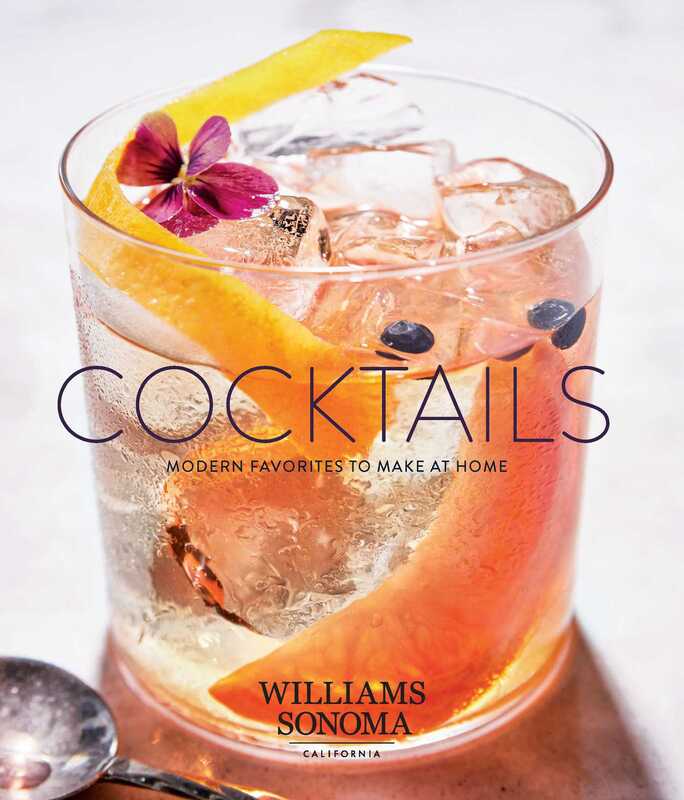 In this compact yet comprehensive book from Williams Sonoma, you’ll find a recipe for any occasion. In Cocktails, you’ll find recipes for Pineapple Orange Gin Rickey, Bee’s Knees, Elderflower Rose Collins, Maple Sazerac, Blackberry Lemonade Whiskey Sour, Old Fashioned with Lemon, Orange and Vanilla, Coconut Cream and Lime Margarita, Ancho Reyes and Cucumber, Grapefruit Rosemary Moscow Mule, Peppermint White Russian, Gingerbread Dark & Stormy, Mango Mai Tai, Frozen Hard Pink Lemonade, Lemon Raspberry Sorbet Prosecco Float, Manhattan, Cosmo, Moscow Mule, Parmesan Twists, Fried Pickles, Devils on Horseback, and many more! When creating a cocktail, begin with high-quality ingredients and a well-stocked bar. Beyond those basics, these indispensable tools will set you up with everything you need to bartend with ease and success. Essential for preparing drinks with fresh citrus, juicers come in many shapes and sizes. A hand- held citrus squeezer is great for lemons and limes, while a citrus reamer is ideal for bigger citrus fruits like grapefruits and oranges. Juicers work well for both fruits and vegetables. Use this baseball bat–shaped tool for crushing fruits, herbs, and sugar cubes. Look for ones made of solid wood with a flat head and long enough to clear the edge of the glass. The v-shaped blade on this stout bar knife cuts long thin strips of citrus for use as a garnish. The warm floral notes of St-Germain soften the tart nature of the traditional greyhound without compromising its bright, refreshing taste. Dampen the glass rim with grapefruit and coat it with salt and the Greyhound becomes a Salty Dog. In a cocktail shaker filled with ice, combine the grapefruit juice, vodka, and St-Germain. Cover, shake vigorously, and strain into an ice-filled highball glass. Garnish with the grapefruit slice.